Who doesn’t love a good pizza? I know that I do. Pretty much any kind of pizza in fact. White pizza, pesto pizza, meat pizza – any type really. Thin crust, thick crust, deep dish – there are just so many possible combinations of pizza, and they are ALL GOOD! I feel like I could eat pizza for days, and not get sick of it. There are just so many different combinations and variations. Of course, pizza is usually not dietetic – so eating it everyday probably would not be the best choice. 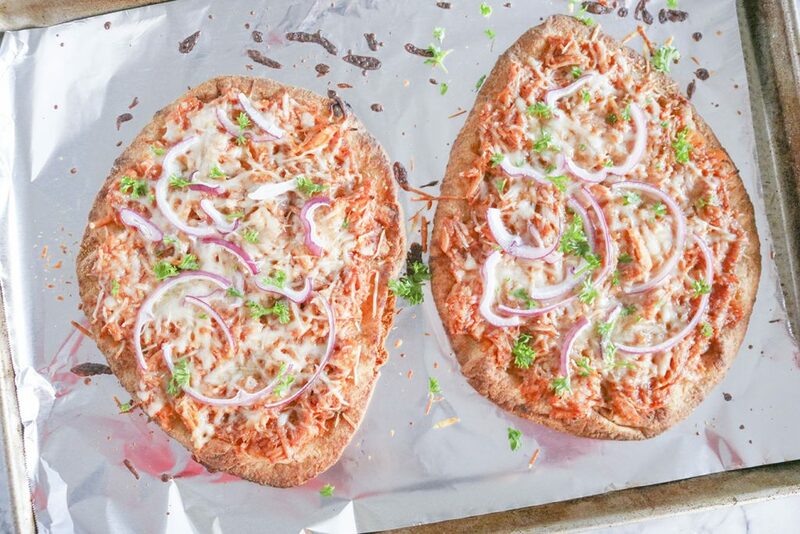 This pizza however, this pizza is easy AND relatively healthy (in terms of pizza…). I started with two pieces of whole grain naan. You can use traditional white naan as well! 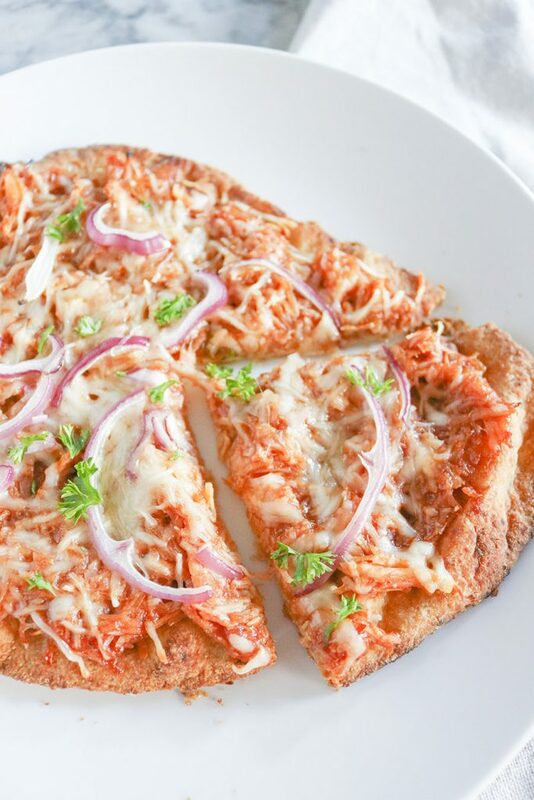 Or of course, you could use traditional pizza crust – pre-made or homemade! 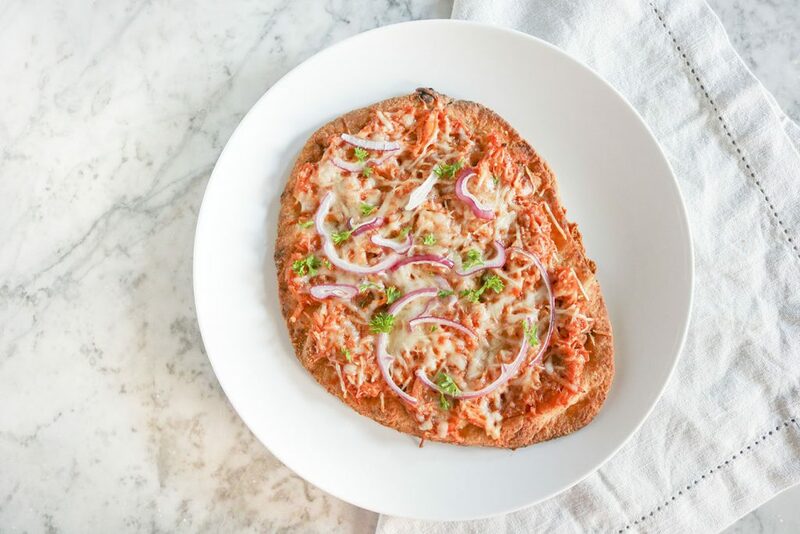 Using a pre-made, pre-cooked crust like this naan is what makes the pizza so easy though. Next up on the ingredient list is cooked chicken – you can use any sort of leftovers that you might have. Rotisserie chicken, grilled chicken, roasted chicken – whatever you’ve got! Shred the chicken, toss with a barbecue sauce of your choice, and you are ready to go! I love love love Sweet Baby Ray’s barbecue sauce. It is hands down the best barbecue sauce available in traditional supermarkets. Finally, there’s the cheese and red onions. 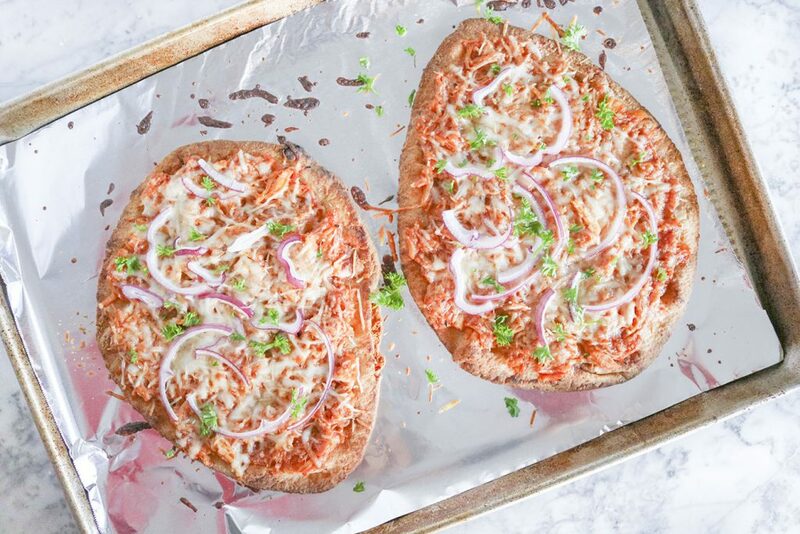 Bake it all together for an amazingly delicious, easy, healthy pizza. Top it off with a few pieces of fresh cilantro to round out the flavor – and YUM! You’ve got yourself a fab dinner, lunch, snack – or whatever! 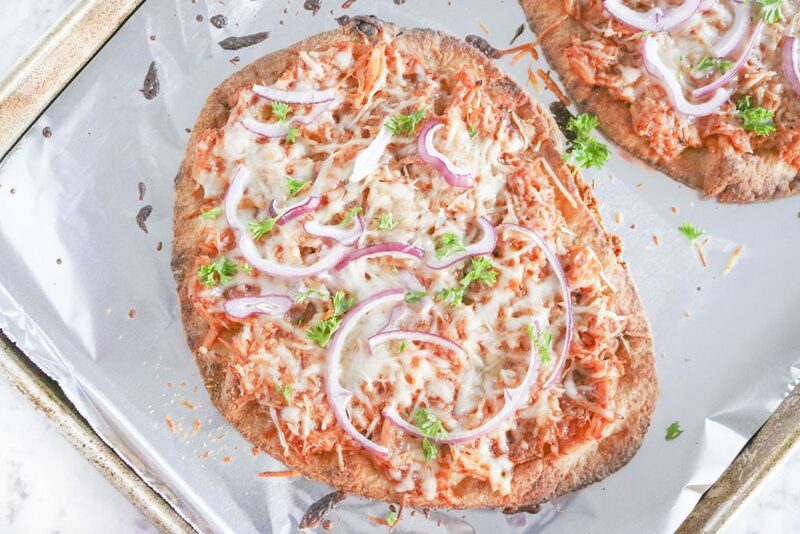 Fresh, easy, and delicious – this healthy BBQ Chicken Naan Pizza is sure to please. 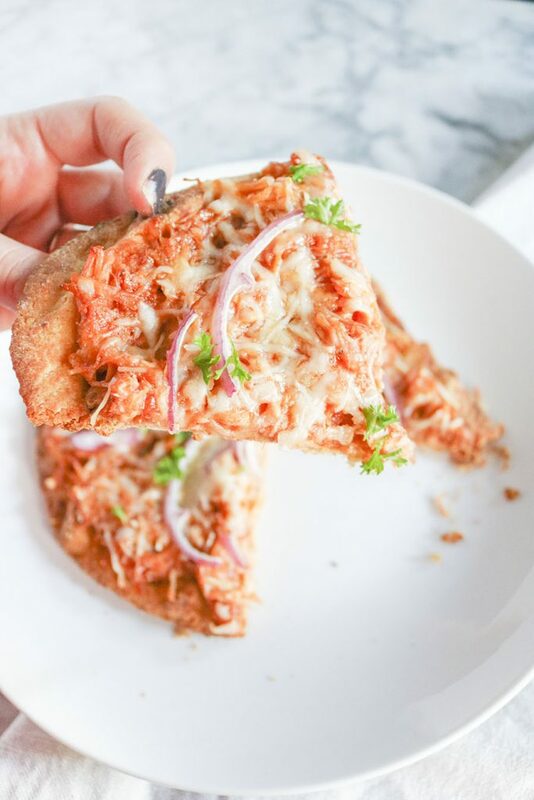 Use your favorite barbecue sauce, leftover chicken, and pre-cooked naan for quick weeknight dinner or fun afternoon snack! Preheat oven to 400F. Set naan onto a lightly greased sheet pan or pizza stone. Bake at 400F for 5-6 minutes or until naan begins to crisp. In a small bowl, combine bbq sauce and cooked chicken – stir to combine. Once naan has cooked, remove from oven and spread bbq chicken onto it, Top with cheese and red onion. Bake at 400F for another 10 minutes, or until cheese has melted and begun to brown. Remove from oven and top with fresh cilantro, cut and serve! Storage: Best enjoyed right away – if leftovers remain, refrigerate in an airtight container for 2-3 days.